Intocable FOH Engineer Jose Ramon Quintero. TEXAS, US – Intocable is an influential Tejano/Norteño fusion band that has been making records and touring for over 25 years. With three Grammy wins and record-breaking stadium gigs in their portfolio, they have paved the way for many Tex-Mex groups that have come after. Their latest Highway tour has taken them all over the US since June and culminates in November in Houston, in their home State of Texas. The band's tools of choice at both Front of House and Monitors are SSL L300 consoles, and Jose Ramon Quintero has engineered with both, previously as Monitor Engineer, and now as Front of House Engineer. "When I started with the L300 on Monitors, the band immediately noticed a huge change in the mix and in the 'room image',” He says. “There is a great separation between the instruments, and there’s a much warmer, more analogue sound than the console we were using before." According to Quintero, the Band's reaction to the technology was an important moment, as they are all accomplished musicians, and most have their own personal studios. "They can really play," he says. "And they can hear too. I think the SSL Pre-amps have made the biggest difference." There are seven members of Intocable and Quintero has a 52-channel input list across drums, percussion, bass, Bajo Sexto, accordion, vocals, and comms. He uses the console's 32 x 36 output matrix for the seven PA outputs, with subs driven from an auxiliary. All 36 matrix outputs of the console have filters, 4-band EQ, delay, all-pass-filters, and insert points for internal and external processing. The SSL All-Pass-Filter has proven to be one of Quintero's favourite features. It's available on all processed paths, and presents a highly tunable processing stage with two filter types, adjustable centre frequency, and adjustable Q. "This makes a huge difference," he says. "Now I can use that tool for mixing as well as for tuning, which is very exciting. The journey from Monitors to Front of House with the same band has been an enlightening one for Quintero; having honed mixes for the individual band members, he was in an excellent position to bring that experience together into the single FOH mix. 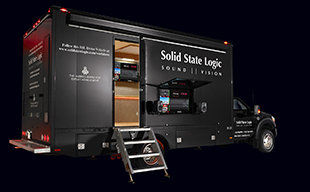 But he believes that the SSL Live console has made a significant contribution too: "This is the first time they have been able to bring their analogue studio sound to a live show. Thanks to SSL for making that possible."